I adapted a recipe which is meant for a banana-nut quickbread to accommodate the ingredients I have on hand. The preparation was quite straight forward, however, the cake would take about 1 hr to bake, and I had to tent (cover the top with a foil) it, about half-way during the baking time. Instead of using a loaf pan, I baked mine using a 20cm (8") round pan. It turned out to be quite a big cake as there would be only the 3 of us at home for these few days. When the cake was unmold, I thought it looked really ugly! After pouring the batter into the pan, I had studded the top with banana slices, trying to copy the way these beautiful banana muffins and this banana cake were made. But this decorating tip didn't work on this cake. My kid even told me the cake looked like a spaceship! We like the slightly crisp crust though. It was baked to a nice golden brown...could it be the brown sugar used? It really reminded me of a chocolate cake if not for the banana slices on top. Since I prefer to taste the little chunks of bananas in the crumbs, I mashed the bananas quite coarsely. I really love the delicious taste and texture of this cake. It was very moist and the sweetness was just right. Furthermore, the addition of some wholemeal flour not only add a wholesome goodness to this cake, it also lends a nutty texture to the crumbs. If you happen to have all the necessary ingredients on hand, this cake is really worth a try. Position a rack in the middle of the oven. Preheat oven to 180 degC (350 degF). Line bottom of a 20cm (8") round pan with parchment paper, butter and flour the sides. Alternatively, you can use a 9 by 5 inch loaf pan, butter and flour it and set aside. In a bowl, stir together plain flour, wholemeal flour, baking powder, baking soda and salt. Set aside. In a large bowl, whisk the eggs until blended and stir in the brown sugar, butter and milk. Add the dry ingredients in 3 batches alternately with the mashed bananas, and stir with a spatula until just blended. Do not over mix. Pour batter into the prepared pan and smooth the top with the spatula. (Optional: Stud the top of the batter with slices of bananas). Bake for 55~60mins or until a toothpick inserted into the centre comes out clean. If the surface starts to brown too much, cover with a sheet of aluminum foil around the last 15mins of baking. Depending on your oven, you may have to do this mid-way during the baking time. Remove from oven, let cool in the pan for 5mins before unmold. Let cool completely on a wire rack. Store in airtight container at room temperatures for 2-3 days or freeze for up to 1 month. honestly, I like the second picture with banana slices on top of the cake. I don't think it's ugly at all! Oddly enough I can't stand raw bananas, but I'm a bit of a fiend when it comes to cake and this looks fantastic! The texture looks great in cross-section, too. this post tells me it's time to get some bananas! A tasty cake that looks like a spaceship? That sounds like it's perfect kid food. If you wanted to dress it up a bit more, you could pour some ganache over the top. I think bananas and chocolate are wonderful together. I don't think it is ugly. Banana cake has such typical look anyway. I did a banana cake sometimes back too. 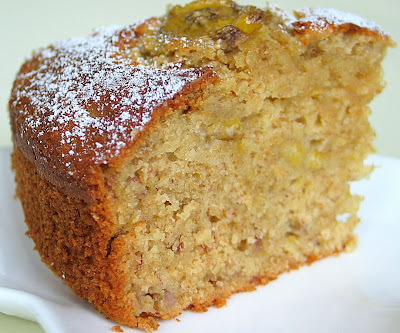 May I know what is the difference between a quickbread and a real banana cake? Thanks everyone for the kind words and encouragement, they really warm up my heart on this cold and rainy seasons. Hi Sherlyn, quickbread is just like muffins...in terms of taste, and the method which the batter is prepared...ie adding the wet ingredients to the dry ingredients to form a lumpy batter. I am hoping to bake this quick bread cos i hv super ripe bananas. I hv similar quick bread recipe that does everythg in a saucepan, also dry into wet ingredients. My recipe ask for 275 g of banana but the weight is before peeling. Then your recipe? the weight before peeling or after peeling? Aimei, I share the exact same sentiments...there are just so many yummy recipes around! Thanks HHB. I think i will hv to try this recipe the nex round, cos the banana not enough. hehe. I think i hv to consider half the recipe or not .. looks like a real big cake by the amount of ingredient. Hi Yuri, that was a lovely banana cake you have made...the bundt pan is beautiful! Photos too blur, so will take tmr then post blog. btw, the wholemeal flour so coarse, i din sieve .. are there fine ones like the plain flour out in the market? oh also, the wholemeal flour from PH is in a fridge .. so we must keep in fridge too? How long can we keep after open? Yet to find any recipes that uses wholemeal. Thanks for answering my queries so fast. I thought I saw wholemeal flour before in NTUC but I cant find it when i want to bake this cake, so I ask my mother buy from PH. hmm bread .. now i m not sure how to finish that pack since no one appreciates the wholemeal goodness in my family accept me. ok gog to post the blog now .. btw, i finish the whole cake liao, yum! .. i baked 3/4 portion. Looks like I hv gain a few KGs. Hi dumb-baker, I am not sure whether the baking soda can be omitted in this recipe. Sorry I can't comment much on this, as I am really relatively new in the area of baking. I would advise you to follow the recipe as I am sure there is some reason for using the baking soda in this recipe? Sorry, I'm of not much help here. Wow! This cake is fantastic! Made the cake and finished half of it almost immediately! I've substituted baking soda with baking powder...and the cake still turns out good...thanks for sharing the recipe. This is definitely a keeper! Gi DB, so it works well even without the baking soda! How nice :) If u were to add in the wholemeal flour...it will taste even better...it gives u this very wholesome texture to it. 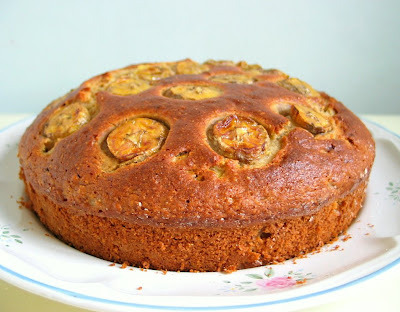 I baked a banana cake using this recipe of yours. The result was very satisfactory. Thanks so much for putting together all these wonderful recipes. Can i use this recipe to make muffins instead?! ;D what temperature & baking time will you recommend? BAD NEWS! :( hahahah my muffins didnt rise, & it turned out rather dry although the batter was wet! i forgot to buy brown sugar, so i used icing sugar + honey as these are the only ingredients i could find.. could it be the reason? P.S but they tasted a lil' better this mrng! BAD NEWS! :( the muffins didn't rise, & it was rather dry although the batter was wet! i forgot to buy brown sugar, so i substituted with icing sugar & honey as these were the only ingredients i could find. could this be the reason? P.S but it tasted a lil' better this mrng! I am not sure whether replacing it with icing sugar was the reason? but most of the time, muffin recipes use caster or granulated sugar...so far I have not come across any that uses icing sugar...maybe that could be the reason. Hope u will give it a try again. may i know what are the differences btw one tt uses milk & the other using yoghurt? Hi Shine, I am no expert in the area of baking...I consider myself a novice :) All I know is, yoghurt helps to make the cake moist and fluffy...but it all depends on the recipe. You can read up more at baking website such as baking911 or joyofbaking. Hope you are able to get the answers from these sites. Cheers! 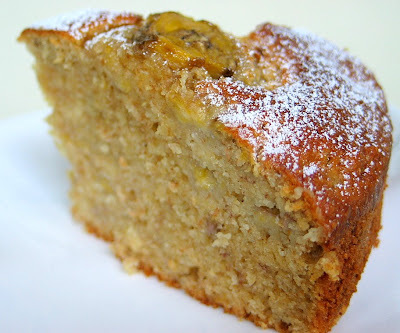 I was looking for a banana cake recipe from scratch, and when I saw your pictures I felt this was the one I needed. It looks delicious. A lot of other recipes use white cake mixes and just add bananas. I wanted something like you describe, a banana nut bread-cake type dessert. I appreciate your putting it online! I was successful in baking this banana cake the first time round, and this time, i omited the wholemeal flour since my kids and hubby don't like it. I am not sure of the consequences of omiting that amount of flour but i still go ahead with the same amount of other ingredients in the recipe. In the end, my cake doesnt look like the one I bake the first time, and it is rather soggy, and more so at the bottom of the cake (not sure if they are the bananas). Any idea y? Is it cos omit wholemeal flour and still keep the same amount of banana resulted in too much of banana so sink to the bottom? Hi Sherlyn, sorry to hear about the undesirable outcome. I am not sure what went wrong, but I have read that wholemeal flour will absorb more moisture, so since you have omitted it, the amount of liquid used has to reduced. 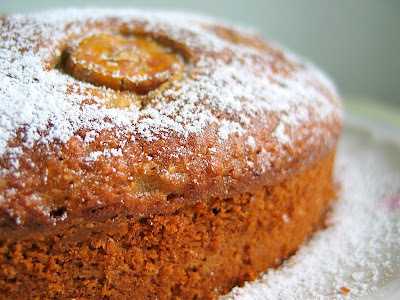 Maybe you can try other banana cake recipes that don't require the use of wholemeal flour. when u whisk the eggs - do u use electric mixer n for how long? - i used a hand balloon whisk n just beat a min, mebbe thts y mine turn out abit dense texture? Hi Becky, I used a manual balloon whisk too. I just beat the eggs for a short while, just about the time taken you will whisk eggs to make a scramble egg or omelette. Maybe your cake was dense due to the folding in of the dry ingredients? Do not over mix, just blend with a spatula till the flour 'disappear' and stop. I tried the recipe on saturday. The cake was fantastic but it was a little too moist (it stick to the palate while chewing). Will reducing the amount of milk help? Increasing the baking time? Hi Anonymous, I am not sure about reduing the milk...maybe you can try increasing the baking time. today i baked this cake, but i had to use a pear because my sister and i ate two bananas in the morning! luckily there was one banana left though. the cake was great, i was worried about not having brown sugar, but i used raw sugar which looked like brown sugar [lol], but the cake come out perfectly! however i didn't spread it evenly enough so when it came out there was this big slope. Oh well, thanks for this great recipe! Your banana cake looks yummy. I'm wondering if you've tried banana yeasted bread before? If yes, could you share the recipe? i've been looking around for banana yeasted bread rather unsuccessfully as most if not all of the recipes that i've come across are for 'banana cake' ie no yeast. in addition, I'll also like to thank you for the great milky bread recipe. this is the 1st time that i've made soft fluffy bread and without any improver/softener too! :) really happy that i've chanced across your blog! Hi Shirley, I'm sorry I have not tried any banana yeasted bread. Will post it if I come across any suitable recipe. Hi, HHH, I tried a different type of banana yeasted bread 2 days ago.I prepared a basic simple dough and used fresh banana as filling.It turned out successfully and very nice to eat. You should try it out ! Hi, HHH, Me again.The raw banana inside the bread I had made stayed fresh even after two days. My husband's friend who ate this bread said "面包内有香蕉？好奇怪！”Do your kids like banana ? If they did, then give them a surprise! It is fun when you ask them to guess what is the filling, but none will ever make the right guess! Hi! I just baked this and it turned out very well!! This is my first time baking, and Im so amazed with the results! I also realised by following the gram measurement is more accurate than using the " cup" measurement. I measured 235gm of plain flour but in fact it is euiqvalent to 2 cups not 1.5 cup as stated in the recipe. Luckily your recipe state ingredients in 'gm' too, very thoughtful of you! Hi Angie, I am glad to hear that your first cake turned out great :) Yes, I prefer to weigh the ingredients too, it is more accurate, in fact the majority of the recipes I posted here are in grams. Hi, I am sorry I am not able to comment as I have never baked a carrot cake before, maybe you can look for other carrot cake recipes that do not call for too much sugar? Hi, i was just wondering....what if i were to bake this with self raising flour? will it still end with the same result? Hi Anonymous, If you were to use self raising flour, you may need to cut down on the baking powder as self raising flour has got baking powder added in it. I think someone has used one of your photos from this blog post. 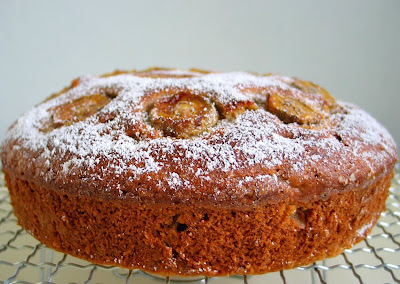 See: http://welladjustedbabies.com/banana-pineapple-and-apple-cake-recipe/ . I am sorry to hear that. Your photography is truly lovely. Notice that your photo has since been removed from the site. Small victory! Hi, I tried out this recipe yesterday and it turned out great! Halfway through weighing the ingredients I realized I actually didn't have wholemeal flour so I used only cake flour. I also topped the loaf with some almond slivers and it gave the banana bread a nice crunchiness. Thanks for sharing this delightful recipe!